The field of research and practice in open, distance and eLearning has been one of the fastest growing in Europe over the last two decades. From just a small number of institutions in the early nineties, spearheaded by the European open universities, the field has transformed into a large community involving all sectors of education and training and most of its institutional and individual players. This astonishing evolution can be best represented by the successful development and important legacy of the European Distance and E-learning Network (EDEN). The association, originally designed to contribute to the eradication of the remaining boundaries of a divided Europe with the input of distance education, gradually evolved to become one of the world’s leading, largest and most powerful networks in the field of open education and technology-enhanced learning. 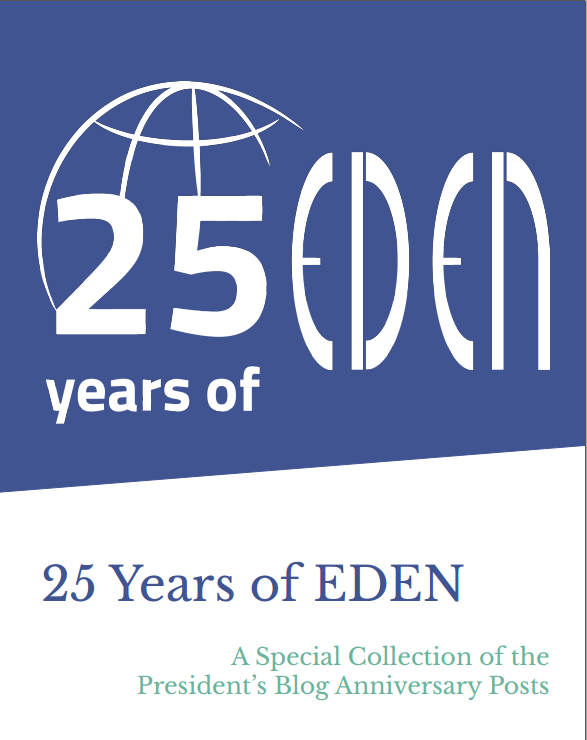 In this publication, EDEN looks back into its past. Based on the testimonials of its former Presidents, we can follow how the association faced and overcame the different challenges and contexts of the field, as well as how it developed its original visions and successful strategies. Above all, we can recall and understand how a continuous and consistent action in favour of the development of the academic and professional community was built out of a multitude of brilliant but dispersed individual contributions. You can download the collection of President’s blog publications here.